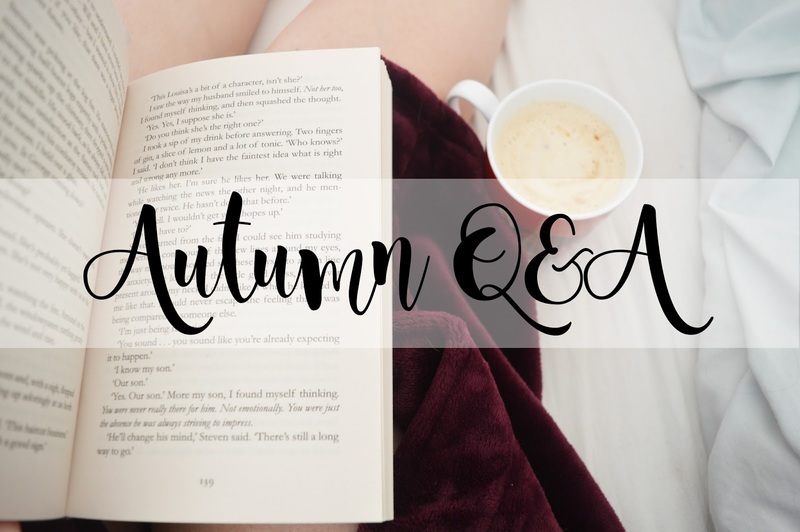 So I decided it was time to do a Q&A on my blog as I haven't ever done one before and because it's Autumn in five days, this is the perfect time to have a theme as my Q&A as well. Throughout September I was asking you guys for your questions over Twitter and today I am going to be answering them! I absolutely love all the questions which were asked, I was very tempted to answer them over twitter however it would completely defeat the object of having the Q&A on my blog, so I resisted! @BlogLilyRose asked "What is your favourite thing about Autumn?" I love the dark evenings, how colder it is and being able to snuggle in bed with a fluffy blanket, fluffy socks, hot chocolate and a book! Sometimes maybe Netflix. @Martha_Molly asked "What made you want to start blogging? And are you glad that you made that decision to stick at it? "I started blogging because I have a passion for writing, it's always been something I have enjoyed since I was a lot younger and I found blogging was the perfect way to express my love for this. I also needed somewhere to escape. I've suffered with depression for around 8 years and never really had anywhere to escape too and just be myself. I'm glad I made the decision to stick at it because it's something which now makes me so happy. @Jayxoxox18 asked "What's the best advice you can give another blogger?" Whenever I'm asked this question, I always reply with the same answer. Be yourself and I can't say this enough. Do whatever you want to do and blog whatever you want to blog about. Your blog is yours, and no one else's and you should be happy with the way it looks and what your content includes. Don't let others influence what you write about because you'll never be happy with it. @Katievlhawkins asked "What's your favourite time of the year?" My favourite time of the year is definitely Autumn, I love how it's not too hot and not too cold, but you can still layer clothing if it does get cold. The smell is incredible when you go outside and the colour of the leaves are absolutely stunning. I love being able to cosy indoors with a dressing gown on surrounded by blankets and this is when I'm most happiest too. @Daisiesforzoe asked "Would you ever want to live abroad? If so, where?" If I were to live abroad, it would probably be somewhere like Greece, Italy or Australia. I've never been to any of these places but they do look absolutely beautiful. @_Ellamay asked "What's your favourite place you have ever visited?" I have only ever visited one place and this is Paphos in Cyprus. I absolutely loved going there with my boyfriend this year and I'll definitely be going back. @Marilyn_Nassar asked "How old would you be if you didn't know how old you are?" I would be in my 20s, probably closer to my 30s. I definitely do not feel 19 and I've never felt my age. @Girsonlychat asked "What's your favourite lipstick to wear during the Autumn months?" I don't have a specific lipstick however if I find a berry red, or purple; I'll be wearing it. They're all so beautiful. I absolutely love Makeup Revolution Lipsticks though. @Mademoisellllee asked "Do you have any sort of planner in place to organise your blog?" I have an academic diary which I colour code for each day, so I know which topic I'm posting about most, and where I can fill in some gaps. I also have a notebook which I write all my notes into for each blog post and when I've scheduled the post, I highlight the title so I know it's done. @Em_book_corner asked "What is your favourite and least favourite thing about Autumn?" My least favourite thing about Autumn is probably the wind. It gets so windy and my eyes water so much and then I have people asking me why I'm crying. My favourite thing about Autumn is how beautiful it is, wearing fluffy socks, being able to wear a jumper without taking it off after two minutes and drinking hot chocolates in the evenings while snuggled under a blanket watching a film. Thank you for reading my first Q&A! Loved this post! Autumn is my favourite favourite season and the color of leaves is the best thing, and feeling cosy!